November 28, 2018 / Modified nov 28, 2018 4:48 p.m. Melt the butter in a medium-size skillet over medium heat. Add the breadcrumbs to the melted butter and stir them around to coat. Add a pinch of salt or season to taste. Cook the breadcrumbs until golden brown and crisp, 3 to 4 minutes. 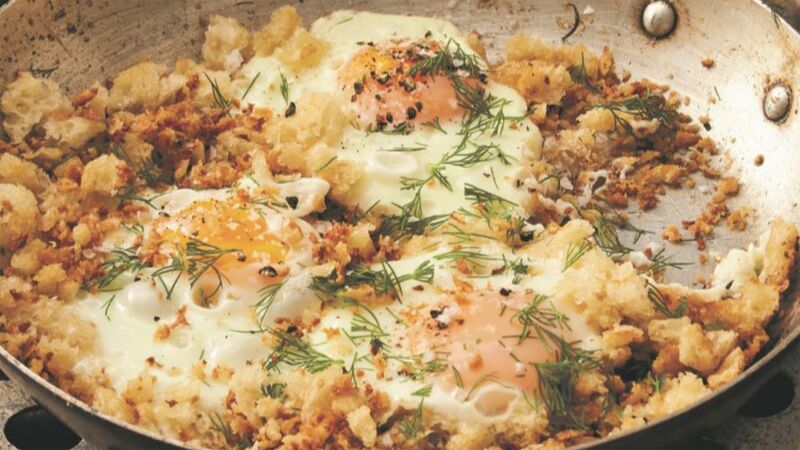 Make sure the breadcrumbs are scattered evenly in the skillet and then crack the eggs on top of them. Continue cooking the eggs over medium heat until the whites are set and the yolks are cooked to your liking, and season with sea salt. This could take just over a minute or up to 4 minutes depending on your yolk preferences. I like my fried eggs over-easy, with the yolk still runny, so once the whites are almost completely set, I flip them over briefly to set the other side, and flip them back again for plating—solely for aesthetic reasons. Sprinkle with salt and pepper, and optionally, a few dashes of hot sauce. Recipe excerpted from Cooking with Scraps: Turn Your Peels, Cores, Rinds, and Stems into Delicious Meals, by Meera Sodha Visit The Splendid Table for more brunch ideas.